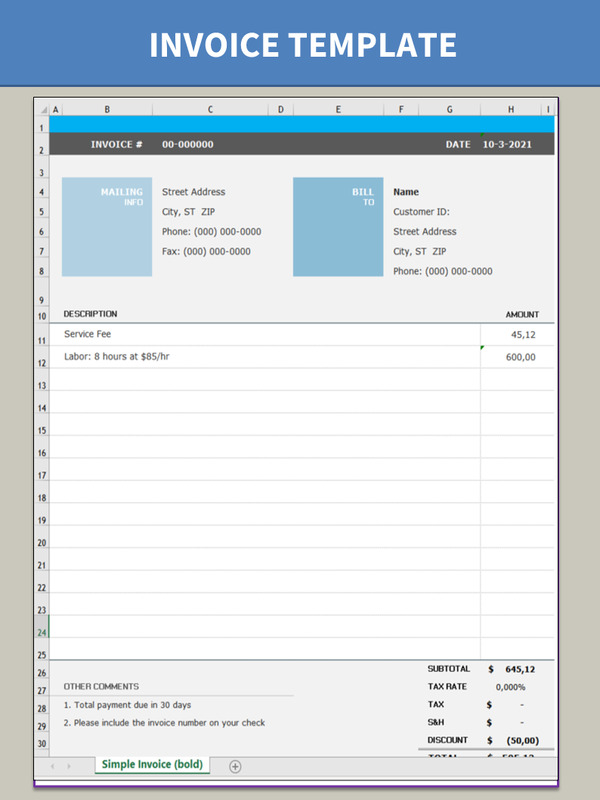 Are you searching for a simple invoice template in Microsoft Excel format? Download this invoice template now! For any startup or SME company providing goods or services, using an invoice that looks professional and can be customized to fit your needs, is important. This basic invoice template will help you get started... Add your company details and payee information, provide an itemized list of the description, quantity, and price of each item you are charging for, and include directions on how your customer may remit payment. This template can easily be adjusted to your need. A definition of an invoice is that it’s a document stating the services or products provided against the costs. The costs will be mentioned on the invoice, and this is the costs that the buyer need to pay within the stated amount of time. Nowadays invoices are often provided online or via email and printed by the customer if necessary. Also you need to take into consideration that you need to add some more details due to local legislation. This Microsoft Excel template contains many accounting templates. This Excel printable invoice file contains two easy to use invoice templates. Now you can easily and quickly make an invoice. This invoice template will help you establish confidence with your customers. What better approach to convince them than by using professional business documents? Feel free to download our basic or advanced invoice layouts and designs, they are intuitive and in several kinds of formats, such as PDF, WORD, XLS (EXCEL including formulas and can calculate sums automatically), etc. Using our business templates guarantees you will save time, cost and efforts and helps you to reach the next level of success in your education, work and business! Download this simple invoice template now! Look here for the best printable invoice templates as PDF, WORD, XLS (EXCEL including formulas and can calculate sums automatically) now.